The IXI DRONEKILLER™ is a cost-effective hand-held neutralization system that defeats small, unmanned air systems (sUAS). The IXI DRONEKILLER™ has been specifically designed for detecting and defeating radio frequency communications with common “quad-rotor” sUASs, such as those available from DJI, as well as command and control (C2) radios used with commercial and fixed-wing systems. The IXI DRONEKILLER™ uses discrete frequency narrowband techniques to disable the target or send the target home. A separately-switched function also allows the IXI DRONEKILLER™ to disable GPS. The IXI DRONEKILLER™ range and efficacy is superior to typical broadband jammers due to its software defined radio (SDR) design and its advanced modulation techniques. Other hand-held broadband jammers have been shown to be largely ineffective against frequency-hopping drones. The IXI DRONEKILLER™ narrowband jamming waveforms has proven to be successful against these types of drones. More importantly, the SDR is field programmable to accommodate the latest waveforms should the drones receive an update to their frequency-hopping algorithm. 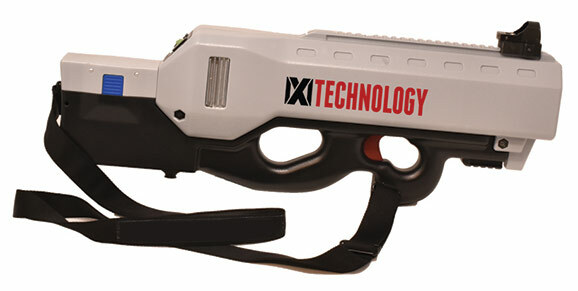 At 7 pounds, the IXI DRONEKILLER™ is a hand-held mobile device designed to be used by dismounted security personnel or in convoys. The Bullpup design allows for ambidextrous use and can easily be fired from a vehicle or a helicopter. It takes less than 3 seconds to activate and engage targets. Once a drone is engaged in the IXI DRONEKILLER™’s 30° degree cone of fire, the drone will be negated in 10 to 15 seconds. For the protection of fixed bases or sites, the IXI DRONEKILLER™ is best used as part of a layered defense or as a gap-filler. The transmission power per band is from 100 mW to 1W depending upon channel type with an effective range of “line-of-sight.” A sUAS will return-to-home when C2 is disrupted but may descend slowly or proceed on an automated waypoint. If the GPS is jammed, then return-to-home and waypoint flight functions will be compromised, and the target will drift or crash. A self-assessment after the NSWC ANTX event determined that IXI DRONEKILLER was less effective in the later sorties, especially those when multiple drones were used. In-house testing revealed that prolonged use created excessive heat that caused the voltage controlled oscillators (VCOs) to drift off their assigned frequencies and initiated the battery protection circuitry, thus reducing the effectiveness of IXI DRONEKILLER. On December 1, 2017, version 1.3 was released. This version included both a software and hardware upgrade. The software improvement compensated for the temperature rise by active temperature compensation of the VCOs, keeping IXI DRONEKILLER within its tuned frequency spectrum. The hardware improvement provided a larger heat sink and improved heat dissipation path that significantly removed the heat from the crucial areas. Additionally, a new battery design improved the operating temperature range and extended the operation of the battery to two hours in active mode. The results were proven when we demonstrated the new 1.3 version to the Beverly Hills Police Department. Operator feedback from handheld testing throughout 2016 and early 2017 led to many advances toward the present technology readiness level (TRL) 9 system. Numerous ruggedness and integration problems of early commercial units were identified by these tests and updated in the current version. The IXI DRONEKILLER™ was first deployed in January 2017 by FBI Los Angeles and Los Angeles County Sheriff’s Department Special Enforcement Bureau at the 2017 Rose Parade in Pasadena, California. It then underwent controlled field-equivalent testing in March 2017 by Air Force Global Strike. Controlled field-equivalent mission testing in May 2017 was conducted by DHS Counter-Terrorism and Coast Guard, Los Angeles County Sheriff’s Special Enforcement Bureau, and Ventura County Sheriff’s Department. Demonstration and limited field testing in July 2017 was done with Oceanside SWAT Team, San Diego SWAT Team and San Diego Police Department Special Events Team, Border Patrol Specials Operations, and Border Patrol Intelligence Unit. Demonstration and limited field testing in July 2017 was done with Los Angeles Sheriff’s Department, Los Angeles SWAT, FBI, Orange County Sheriff’s Department, and San Diego Naval Station Force Protection Team. Demonstration and limited field testing in August 2017 was done with Marshall University Police Department and Huntington, West Virginia SWAT Team. Participated in Naval Surface Warfare Center (NSWC) Crane’s, Advance Naval Technology Exercise (ANTX) Innovation and Sensor Fusion Experimentations August 2017 at Muscatatuck Urban Training Center, Camp Atterbury (MUTC), Indiana. Demonstration and limited field testing in September 2017 was done with San Luis Obispo County Sheriff’s Department, Pismo Beach, San Luis Obispo and Morro Bay Police Departments, and Special Agents from California Department of Corrections and Parole. Demonstration and limited field testing in September 2017 was done with Orange County Sheriff’s Department, Orange County Fire Authority, San Bernardino County Fire, Department of Forestry and Fire Protection (CAL FIRE), Los Angeles County Regional Training Center, and 4th Light Armored Reconnaissance Battalion. The IXI DRONEKILLER™ is a self-contained unit that is less than 27 inches long and weighs approximately 7 pounds. The unit contains a lithium-ion battery that can run for 8 hours in standby mode or 120 minutes in active mode. Its nominal power is 145 watt hours. The IXI DRONEKILLER™ also comes with an external power cable that can be plugged into a power source for continuous power. The IXI DRONEKILLER™ operates between –20°C (minus twenty degrees centigrade) and +40°C (plus forty degrees centigrade).